As you've likely noticed by now, we're back from our little break at the end of last year. Computers are on, phones are ringing, printers are a-printin'. But if you'll indulge my love of metaphor a moment, we'd like to hit the snooze button to grab "just five more minutes." Oh, we'll have a new PDF up for you soon enough, rest assured. For now, though, we've got a past blaster for you. 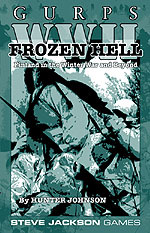 GURPS WWII Classic: Frozen Hell has been put up for sale on e23 while we recover from our long winter nap. It's the definitive how-to book for pitting Finns against Franz. It covers their triumphs and tragedies, offering a nifty alternative to the forces you usually see attached to WWII gaming. Given the current time of year, I think it's also a cute joke on the part of the person who schedules our PDF releases. So there you go. Something old today, and the promise of something new tomorrow. Probably. Maybe. Just five more minutes?